Party Pavillion - Jagram-Pro S.A. The Party Pavilion is a great, lightweight structure made of bent laminated timber. 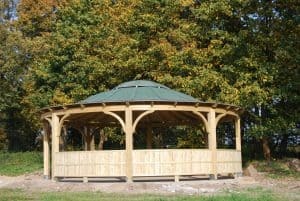 It utilises the best quality square timber and wooden arches. It is a functional solution since it can play many roles, like being a room for festivities, outdoor parties or a barbecue spot in a domestic garde.